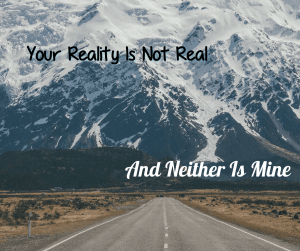 In “Your Reality Is Not real (Nor Is Mine)”, we explored how our beliefs can alter our senses and keep us stuck. Here, we explore how to expand our awareness and explore other possible realities so we can get better results in our lives. Sometimes, the first step in overcoming an obstacle is to admit that it’s there. If you have an area in your life in which you are not doing as well as you’d like, chances are you have a limiting belief in that area. If you have a limiting belief, chances are you’re distorting your reality in a way that prevents you from sensing and getting to possible solutions. One great thing you can do is be open to the idea that you could believe and do things differently. Once you do that, all of the following will be easier. The “as if” frame or “pseudo-orientation in time” as it’s sometimes called is an easy way to put us mentally in a place where we already have the solution to our problems and have reached our goals. This sends a powerful message of achievement to our unconscious mind and, at the same time, bypasses many limitations our belief systems and attitudes might contain. To do the as if frame simply go in your mind, to the future and step into already having achieved your goal. Do it first-person (be yourself–don’t see yourself) and “as if now” (“I am”, not “I will”). For instance, if a smoker might say, “I can’t stop smoking. I’ve been doing every day for 20 years.” If you ask yourself “How is smoking for 20 years good?”, you might have several possible answers. The smoker might be tired of smoking. Smoking for 20 years shows consistency and determination. It could indicate that once they do something, they do it all the way. All of those ideas can be delivered back to the smoker to help loosen the dis-empowering beleif that stopping is hard. Sleight of Mouth patterns covered in depth, here. You can learn more about presuppositions in Practical Guide to Covert & Conversational Hypnosis.